The Shore Excusion brouchure said that guests going on The Bay of Fundy Coastal Photography tour would “get photography tips and techniques from a professional photographer while visiting several beautiful Bay of Fundy locales.” This description appealed to me for two reasons. First, having been to St. John, New Brunswick many times, I wanted to see some of the surrounding area. Going to “beautiful” spots sounded like a good way of exploring New Brunswick. Second, I have an interest in photography. Indeed, it is part of what I do. There are a lot of photos on Beyondships. In addition, over the years, I have sold and/or published numerous photos elsewhere. It is nice to be around people who share an interest and there is always something to be learned from listening to another photographer. According to our guide, this tour was developed by a well-known local professional photographer so as to include typical New Brunswiuck locales that a professional photographer would use in his or her work. 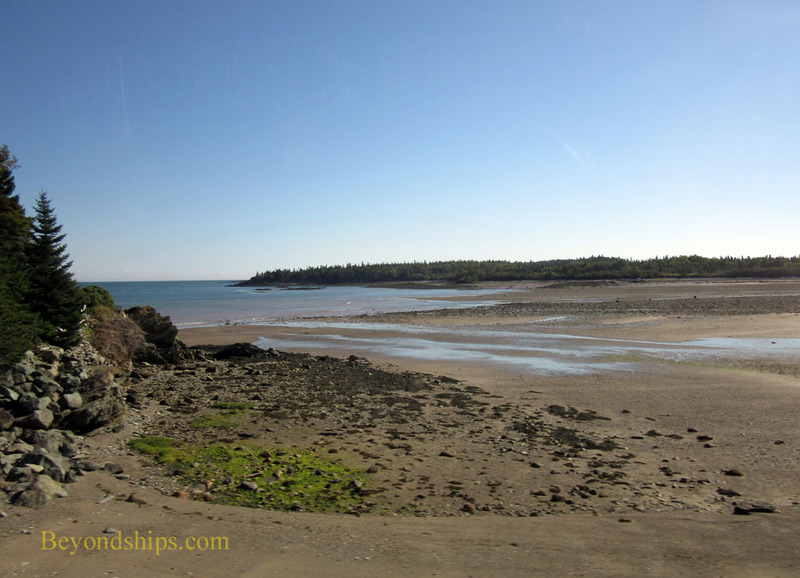 As a result, during this three and a half hour tour we visited four locations around the Bay of Fundy, each different in character. Our first stop was the Reversing Falls, St. John's most famous attraction. 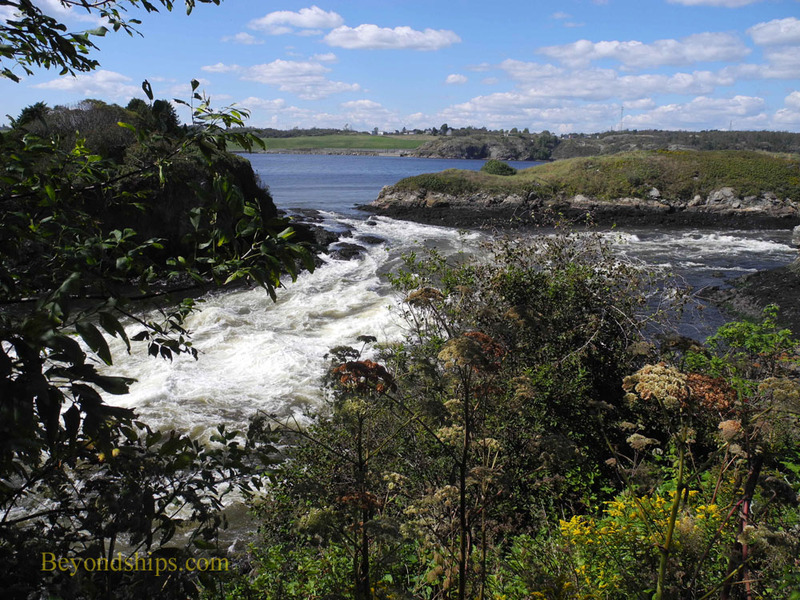 The Reversing Falls is not a waterfall like Niagara Falls but rather a series of rapids on the St. John River where it passes through a high gorge. What makes them interesting is that at high tide inflows from the Bay of Fundy force the river to flow in the opposite direction. The Reversing Falls extend over a fairly long stretch of the river. We stopped at the viewing area at Fallsview Park at the start of the Falls. Buses and taxis often stop here because there is a place to park and because it is close to the river itself. I prefer the viewing area further downstream at the top of the gorge because the view is more dramatic and because there is a large paper mill across the river from the Fallsview Park viewing area. However, our guide explained how to keep the paper mill out of the photo and just capture the impressively turbulent water. Our next stop took us away from the city. 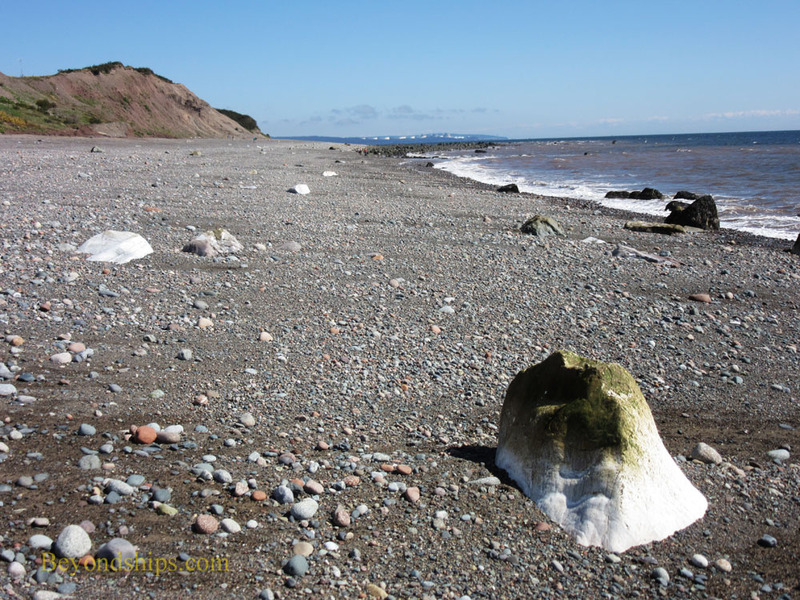 The Irving Nature Park is on the Bay of Fundy itself and because the level of the Bay of Fundy changes dramatically with the tides, areas that are now beaches become sea bottom in a few hours. 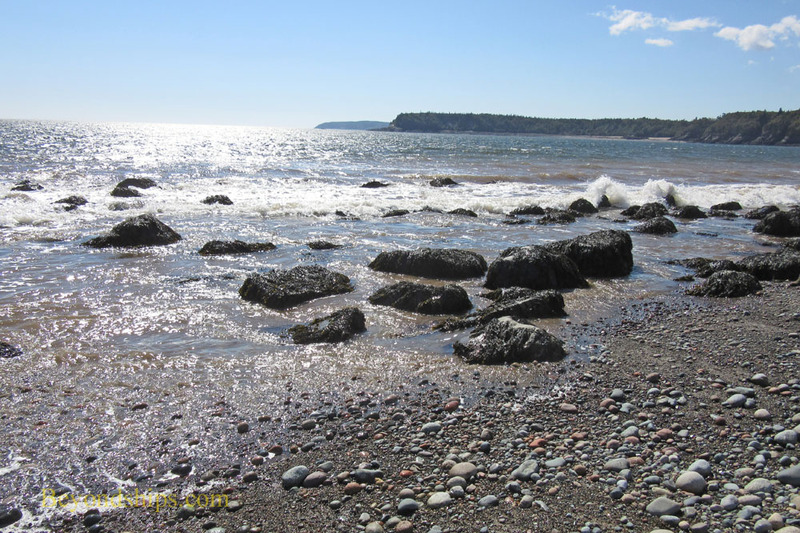 We stopped at a long cresant-shaped stretch of beach covered with stones rounded by centuries of interaction with the tides. At one end, you could see forest-covered headlands while at the other there were tall redish cliffs. Out at sea, you could see a tanker moving slowly across the horizon. We went further inland next. 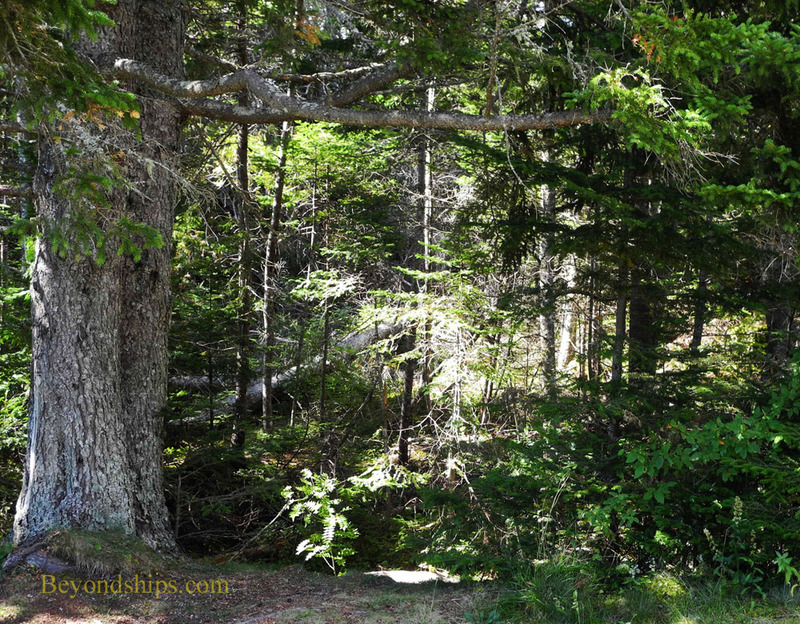 New Brunswick is largely unspoiled, covered with forests and wetlands. Our goal was a Lepreau Falls, which lies hidden in a forest. This was a much more traditional falls with water dropping vertically over two rock cliffs. We left the bus at a viewing area where we could an overall view of the falls and the river flowing away from it. From there we walked a short distance to an area near the top of the falls. Both views were very scenic and the passengers took numerous photos. 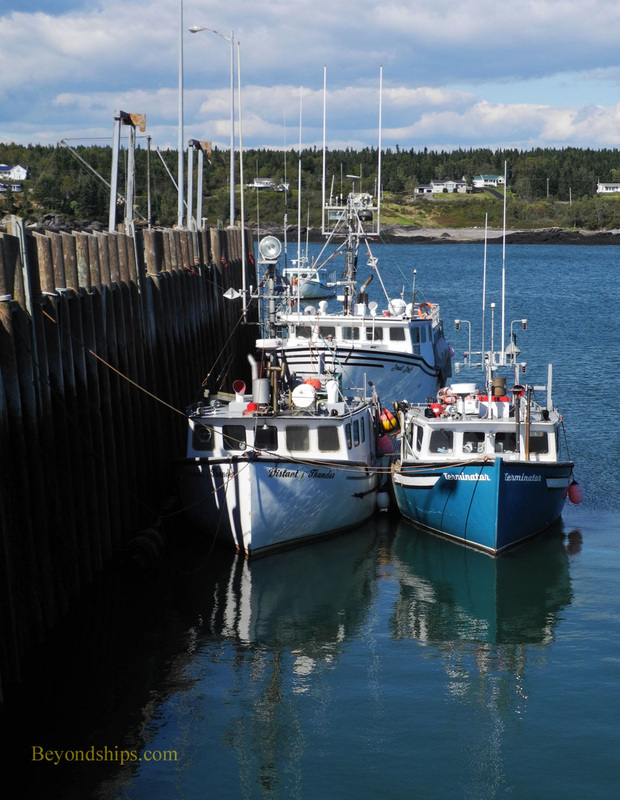 The final stop was a wharf at Dipper Harbour, which is still used by New Brunswick's fishermen. This part of Canada has a long tradition of fishing and the two floating piers adjoining the wharf were lined with small fishing boats. Out in the bay were rafts piled high with lobster traps. It was yet another side of New Brunswick and thus interesting from a social viewpoint in addition to its photogenic quality. As the brouchure had promised, our guide was a professional photographer who lives in the area. As a result, she was able to give us her insights into shooting photos at the various locations that we visited. This included such things as how to deal with the position of the sun and the best spots for taking a picture. She also gave us tips on photography in general. These included basic advice such as always carry spare batteries and photo cards for your cammera to more techinical advice such as how to use a telephoto lenses to bring the background closer when you are photographing a person standing in front of some landmark or item of interest. In addition, she spoke about how to pose people and how to compose a photo. Tweleve passengers participated in the tour. They ranged from one avid photographer with bag and tripod to one more casual photographer who used her I-phone to take pictures. Most of the passengers had point-and-shoot cameras although there were a few SLRs as well. The guide kept her narrative at a level that would engage this diverse spectrum of passengers. In other words, you did not have to be a professional photographer in order to enjoy this tour. Because the tour was limited to a small number, our vehicle was a mini-bus rather than a large tour bus. This undoubtedly contributed to our ability to visit several locations as it was quite maneuverable and could go where a larger bus could not. Also, we did not have the waiting often associated with loading and off-loading passengers from a tour bus. In sum, the Bay of Fundy Photography tour did exactly what I hoped it would do. Above: The start of the Reversing Falls at Fallsview Park. Above and below: The beach at the Irving Nature Park. 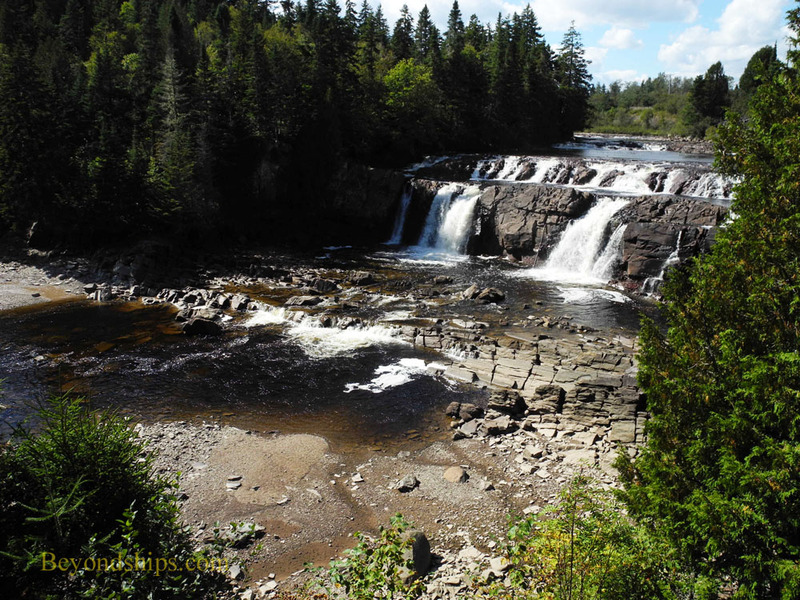 Above and below: Lepreau Falls. 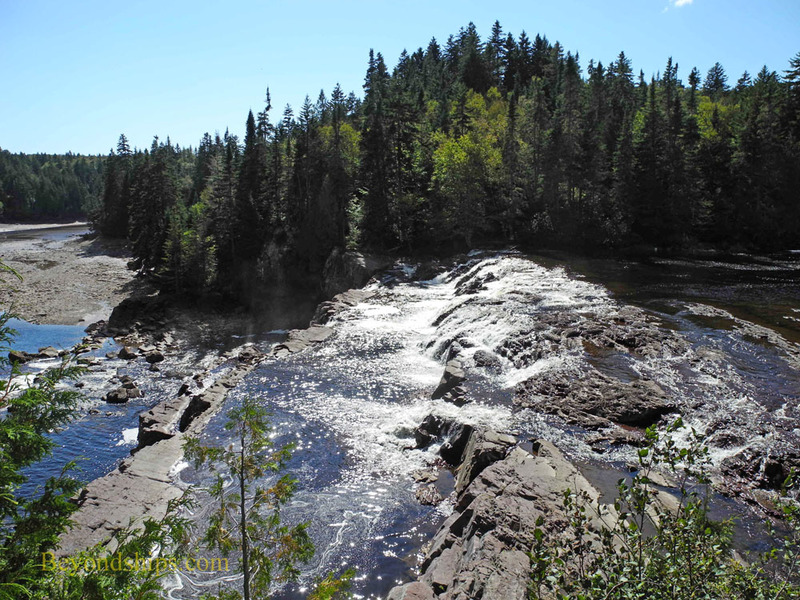 Above: Deep woods surround Lepreau Falls. 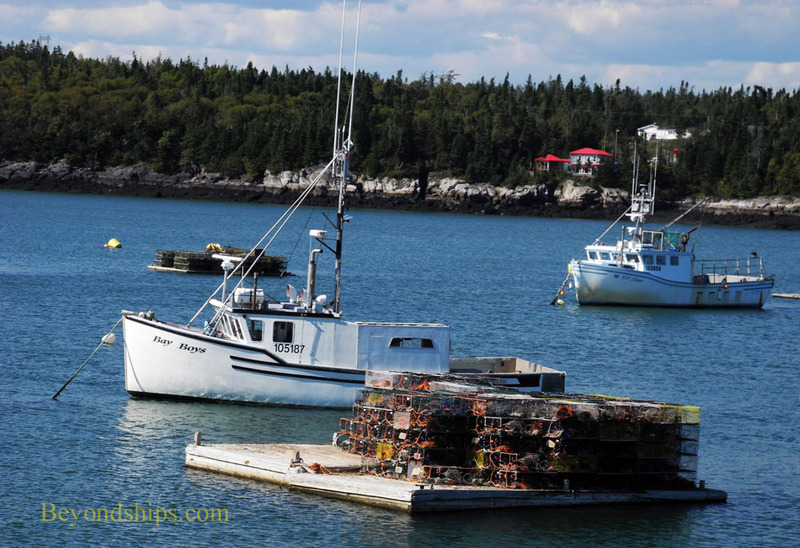 Below: Fishing boats and lobster traps at Dipper Harbour. 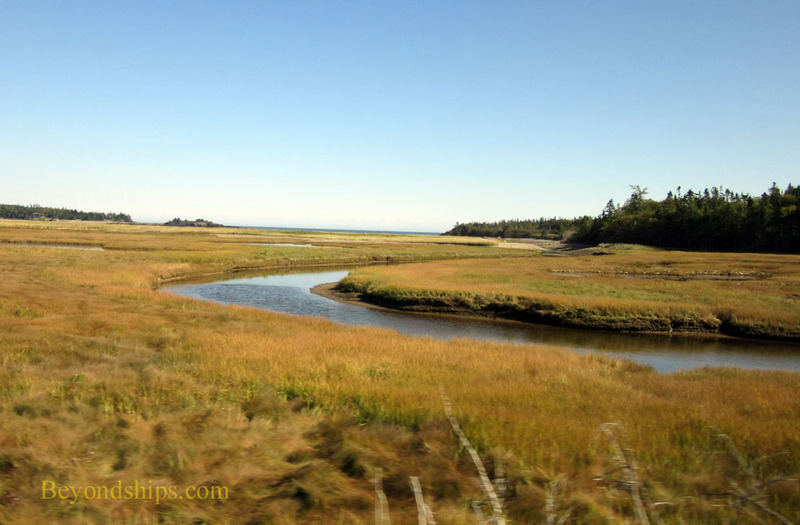 Above and below: Scenic New Brunswick from the bus going between the various stops on the tour.